JNN 02 Feb 2013 PESHAWAR: The Tehrik e Taliban Pakistan ( TTP ) have nominated the names of five political and religious leaders to mediate peace talks with government negotiators, their spokesman said on Saturday. The names include Pakistan Tehrik-i-Insaf (PTI) Chief Imran Khan, Maulana Samiul Haq, former chief cleric of the Lal Masjid in Islamabad Maulana Abdul Aziz, Professor Mohammad Ibrahim of the Jamaat-i-Islami (JI), and Mufti Kifayatullah, a former lawmaker of the Jamiat Ulema-i-Islam (JUI-F) from Mansehra said to have close ties with the Taliban. Earlier this week, Prime Minister Nawaz Sharif said his government had decided to pursue peace talks with Taliban militants to end years of violence despite a recent spate of attacks. The premier named a four-member committee comprising his Advisor on National Affairs Irfan Siddique, veteran journalist Rahimullah Yusufzai, former ambassador and expert on Afghanistan affairs Rustam Shah Mohmand ( PTI ) and former ISI official Major (Retd) Amir Shah to facilitate the dialogue. Speaking to Media on Saturday, Tehrik-i-Taliban Pakistan (TTP) spokesman Shahidullah Shahid said the five “mediators” would facilitate peace talks between the government team and the TTP. The banned militant group announced the names after a meeting of its central shura (council) which was held at an undisclosed location. “The Taliban are entering talks with clear intentions and an open heart,” said Shahid. “Our emir Mullah Fazlullah supports the five-member committee we have nominated. “Our shura will communicate its stance to the five nominees who will mediate talks with the government team,” he said. Speaking to DawnNews, Professor Mohammad Ibrahim confirmed that he had been contacted by the TTP to “act as a solicitor” on their behalf. “It does not matter what side we represent. We will try to fulfill our responsibility to bring peace in the country…and hope that we will be able to achieve lasting peace,” he said. Maulana Abdul Aziz also confirmed that he had been contacted by the TTP, though he said he would decline to be a part of the process if he feels the government was not serious in negotiations or in implementingShariah law in the country. Meanwhile, PTI chief Imran Khan sent a message from his official Twitter account that the “TTP should select their own Taliban representatives 4 (for) peace talks”. However, Khan said the party would discuss how it could assist in the dialogue process at a meeting of its core committee scheduled for Monday. 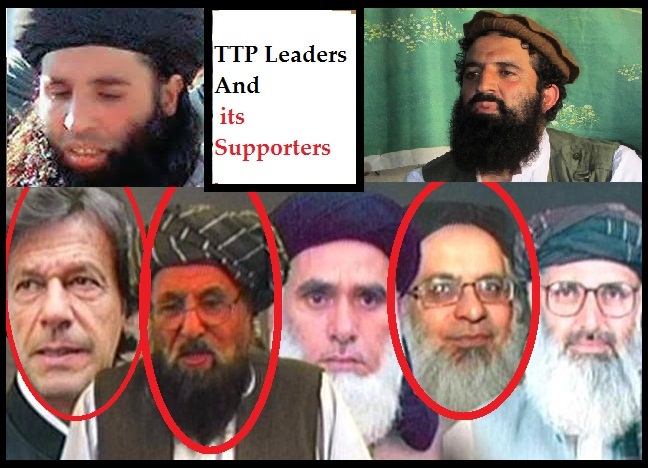 Now it is not a mere concidence that atleast 3 Confidante of the Terrorist Organisation TTP and now the Members of Negotiating Team of TTP , were even earlier consented by the Present PML – N Lead Pakistani Government to be Members of the Pakistani Government , which includes the names of Maulana Abdul Aziz Pesh Imam of Lal Masjid , Maulana Sami Ul Haq , and now Imran Khan the Biggest Advocate of Negotiation with the Taliban . While Maulana Abdul Aziz , Pesh Imam Lal Masjid , who was earlier contacted to represent the Pakistani Government , but who declined to represent the Pakistani Government side , but now has accepted the nomination of the TTP , for negotiating on their Behalf . Now the Vague Picture ,which was even earlier Clearly shown by Jafria News Team as of the Pakistani Politics is Once again coming Crystal Clear , as it was even indicated that the Politicians who advocates the Negotiations are on the Panel of TTP , and were Hidden their Taliban contacts and their Foreign Roots are now quite Exposed . Now Imran Khan , who is commonly referred in his Public Status as Taliban Khan , Who’s Party PTI is running the Provincial Government of KPK , Has also come with the support of the sponsors of Taliban , The Saudi Monarchy , while the Federal and the Provincial Government of Punjab is also given to the another Strong Saudi Monarchy Ally, Nawaz Shariff , the Leader of PML – N , and now the PM of Pakistan , Now the Drama is coming to its Conclusion, as The Saudi Monarchy is Trying to go to any limit to Win the Talibanisation of Pakistan , which they could not do during the Last Tenure of Nawaz Shariff , as the Army Top Brass , interfered in and Ex General Musharaf ceded Power , in an Army Coup . However The Patriot Pakistanis and the Especially the Jafria Community is also ready to go to any limit to resist the take over of Pakistan By the Taliban Ideology , As the Shia Political / Religious have already condemned the Negotiation with the Traitors of Pakistan and Terrorist Organisation TTP . As will definitely lead to Disaster and Destruction of Pakistan. This entry was posted in Asia Pacific, Current Affairs, Jafria, Pakistan News and tagged Imran Khan, Maulana Abdul Aziz, Mulla Fazalullah, Mulla Radio, nawaz shariff, pakistan, pml n, saudi monarchy, Shahid ullah Shahid, Tehrik e Taliban Pakistan, TTP. Bookmark the permalink. He has taken everybody for a ride, but he has got to be a bigger fool!The truth has a very funny way of coming out,All this drama of civilians getting killed by drones and stopping the NATO containers, and his sing song of this is not our war- his godfathers nominated him to be on the team for “peace” talks! Does it come as a surprise to any body that TTP want imu to be included in the negotiating team-proof if proof was ever needed for the world to see that imu is with the terrorists!